Scarce Rutter deatiling the Windward Passage. A Description of the Windward Passage and Gulf of Florida, with the course of the British Trading-Ships to, and from the Island of Jamaica. Also an Account of the Trade-Winds and Currents on the Coasts thereabouts, at different Seasons of the Year. 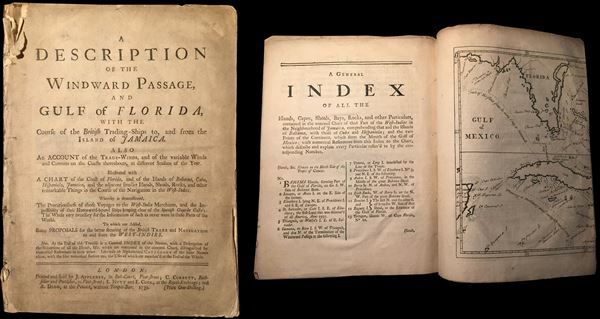 Illsutrated with a Chart of the Coast of Florida, and of the Islands of Bahama, Cuba, Hispaniola, Jamaica, and the adjacent smaller Islands, Shoals, Rocks, and other remarkable Things in the Course of the Navigation in the West Indies. An extremely rare first edition of John Cowley's rutter (nautical guidebook) of the West Indies, particularly the important Windward Passage between Cuba and Hispaniola. This document was intended for navigators and tradesmen with an interested in the English West India Trade. It describes the route from the Gulf of Florida through the Windward Passage into the Caribbean, where ships would pick up the trade winds that carried them across the Atlantic to Europe. The volume contains a basic introduction to navigational terms, then a series of instructions and descriptions describing the route, current, nautical conditions, and winds. A second section details Proposals for better securing of the British Trade and Navigation to and From the West Indies. Section three is an Index of the island capes Shoals, Bays, Rocks and other Particulars of the region. This section accompanies an interesting map with manuscript annotation entitled A Chart of the Bahama Islands with a description of the Gulf of Florida…. Unfortunately only the left hand portion of this map is present. This volume was printed by John Applebee of Bolt-Court, Fleet Street, London. Typically this is a 16,000 USD volume, but because of the damage to the map, we are offering it at a much reduced price. Since the value here is not really the map anyway, this represents an exceptionally good deal for anyone interested in early Navigation around Florida, the Bahamas, and Cuba. John Lodge Cowley (1719 - 1797) was an English cartographer, geologist and mathematician. John Cowley was a professor of mathematics at the Royal Military Academy, Woolwich, London, for a number of years between 1761 and 1773. He was elected a Fellow of the Royal Society in April, 1768. His mathematical methods were famous, but he was also an important geographer as well as Royal Geographer to King George II. He specialized in maps that depicted the counties of the United Kingdom from which arose his most famous work, Counties of England. Cowley published several maps often in conjunction with Emanuel Bowen, engraver. Among his more notable works are superb engravings representing the constellations drawn on glass globes created by Thomas Heath. He also, in his capacity of Royal Geographer, published an important rutter of the Windward Passage to the benefit of English plantation trade in the West Indies. Cowley taught geometry to subscribers of the St. Martin's Lane Academy, a drawing school established by William Hogarth and John Ellys. He died in Walworth, Surrey, and was survived by a daughter, Mrs. Johnstone, who inherited her father's passion for cartography. Sabin, J., A dictionary of books relating to America: from its discovery to the present time, 19726. Brown University, John Carter Brown Library, ESTCT31704.